You see a pattern and it speaks to you. And not just a "Oh, that's cute" kind of know. Or "I may have the yarn in my stash already" knowing, but a deep resonance in your knitting bones. Sometimes you just know when something is the perfect project for you. That’s the way it was when I saw Verdant. Yes, I fell in love, but it was more than that. I knew it was going to be perfect for me. It wasn’t quite your average shrug. It was a little quirky, like me. I loved the stitch used at the bottom of sleeves. Also, it seemed like it would fit my long arms well. Despite my love for it, it took several months for me to actually buy the pattern. I had the yarn for it in my stash for years, acquired in a yarn swap in 2010. The pattern sat in my queue for the longest and I would lovingly gaze at it. I finally decided to buy it as a reward for finishing some of the edits on my novel that I recently self-published. It took me only six days to knit it, and that's with ripping out six inches to correct a mistake. And as I suspected, it turned out great. Really great. So great that when I posted a pic of me wearing it to Facebook, I got over 25 likes in a matter of minutes. 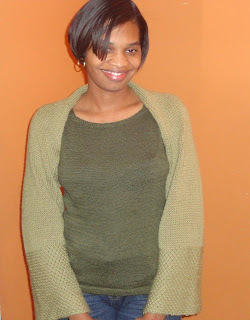 So great that the designer asked if she could use my pic for the Verdant pattern page on Ravelry. That was a pleasant surprise and a first for me. I can’t wait until the weather changes so I can wear my Verdant with pride. It was the perfect project for me.